I love Corn! I grew up loving Mexican street corn, you know, the kind that’s sold out of a little cart, or van, or at a random park. That’s totally normal for everyone right?! Well, maybe it’s not normal for everyone, but where I grew up in Southern California it is. I’m talking about delicious, buttery, mayo-ee, cheesy corn. 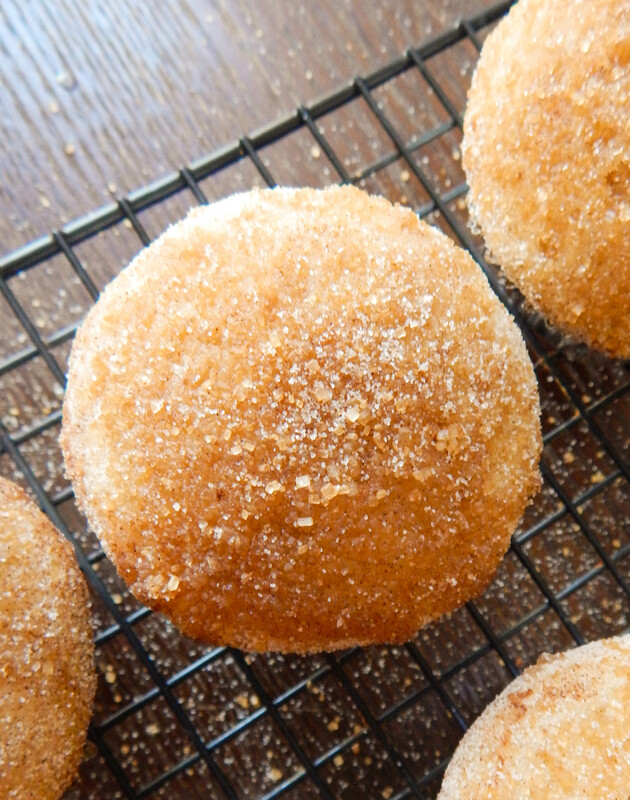 This is how I make it at home, and let me tell you… It’s delicious! I keep it true to the original Mexican flavors I love so much, but give it my own twist by grilling the corn and making a chili lime mayo that is spread all over the warm corn and melts right into all the little nooks. 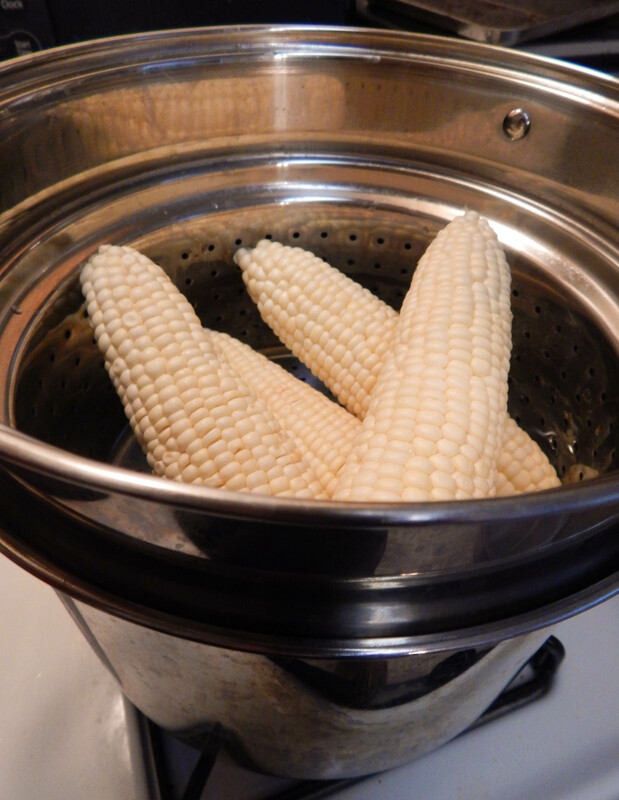 First I steam the corn in a big pasta pot for 20 minutes with the lid on. Steaming the corn will allow it to get tender on the inside, but still keep a nice crunch. After the corn is steamed I rub it with some butter and put it on my indoor grill pan. I grill it for 10-12 minutes, and I turn it every couple of minutes to evenly grill all sides. The photo above is after about 5 minutes. I love to grill on my grill pan. It’s super easy and still gives food nice grill marks and smokey flavor. You could definitely grill the corn outside if you wanted to, especially if you have people over or if you are grilling other foods outdoors as well. 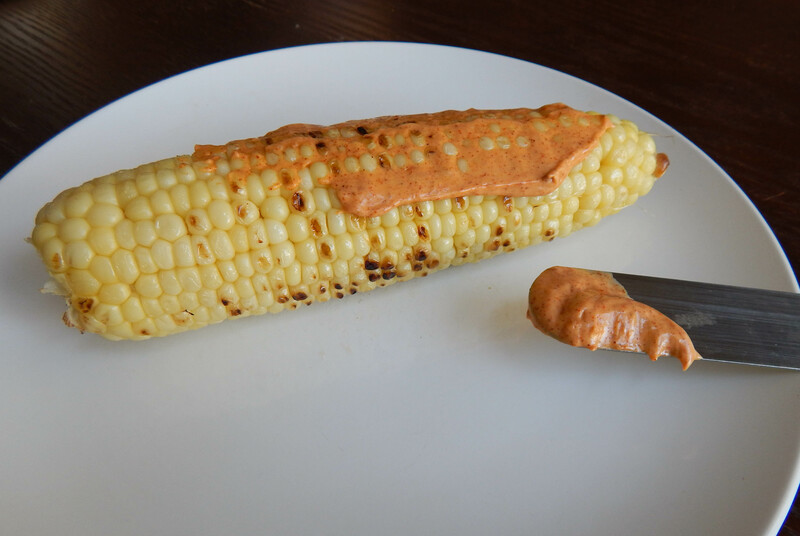 While the corn is grilling I make the chili lime mayo spread that gets slathered all over the warm corn once it comes off of the grill. Look at that pretty color! The chili powder that I use is ground California Chili. I buy the packet in the Latin section of the grocery store or at a Latin grocery store. I love this chili powder because it is smokey without being spicy. The flavor it gives is perfect and compliments the grilled corn wonderfully. I love that you can see all of the little chili specks in the mix too! If you can’t find ground California Chili, you can substitute your favorite chili powder. 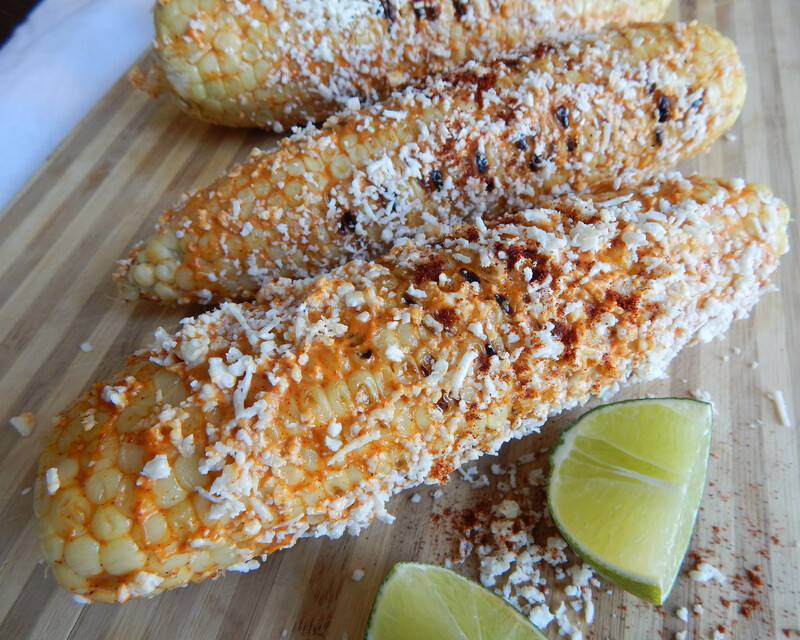 Spread the chili lime mayo onto your corn as soon as it comes off the grill. I do let it cool for a minute or two just so it is not too hot to handle, but you want it to still be warm so that your mayo can melt into it and seep into all of the tiny spaces in between the corn kernels. Don’t be shy, cover it completely! You need a nice coating so that the cheese will stick to it, and because it is just delicious and you want all of that flavor in your mouth like, now. Next, sprinkle on cotija cheese. Co-tee-ha. Cotija is a hard Mexican cheese that you can buy already crumbled or shred/crumble yourself. It has a salty flavor and a very distinct stinky smell. That sounds scary, I’m sorry, but it does, and that’s okay… it is so good. I don’t think there is a substitute that does the job. Some people use grated Parmesan cheese, and I love me some Parm, but it is not the same. However, if you only have Parmesan and really want to make this, try it anyway! And there you have it! 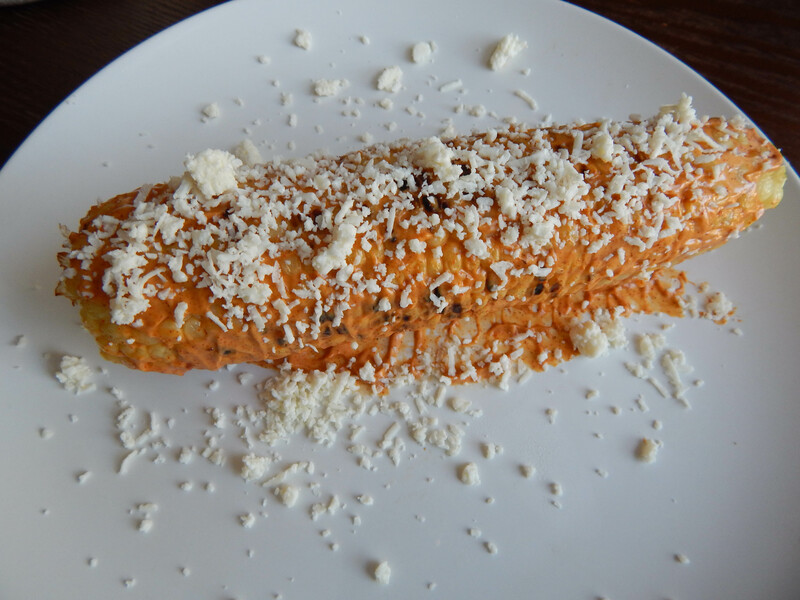 Warm, cheesy Mexican street corn, and you didn’t even have to chase down the corn man pushing his cart down the block. So if you love corn like me, make this! The flavors are bold and exciting. Just make sure you have lots of napkins handy. 1. Place corn in a large pasta pot or any other steaming pot and fill the bottom with 2 inches of water. 2. Turn on heat to medium high and cover. Steam for 20 minutes. Add more water if needed. 3. Remove corn from pot and drain off any excess water. 4. Preheat grill pan to medium high heat. 5. Rub Corn with butter on all sides, and be careful, corn will be hot! 6. Once the grill pan is heated place the corn on it, and grill for 10-12 minutes rotating the corn every couple of minutes to lightly char on all sides. 7. 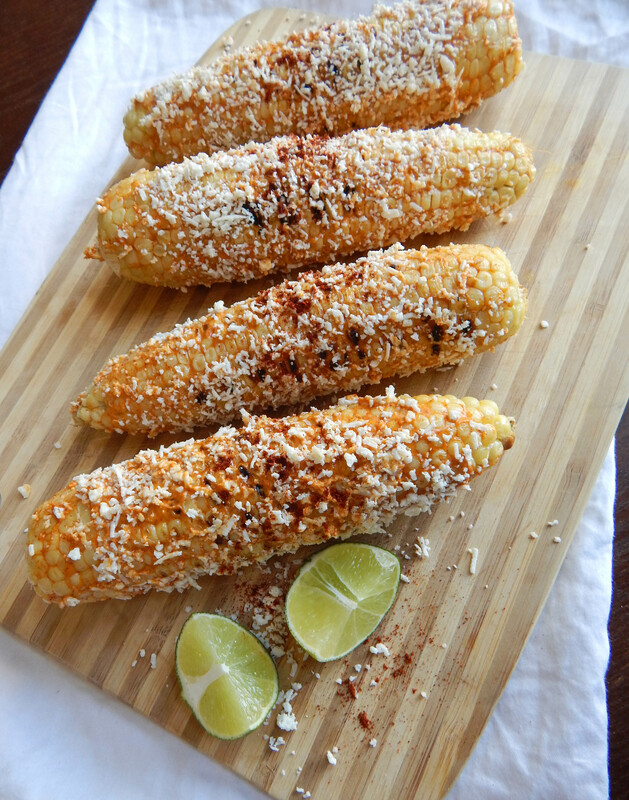 While the corn is grilling add mayonnaise, lime juice and ground California chili powder to a small bowl. Whisk to combine. 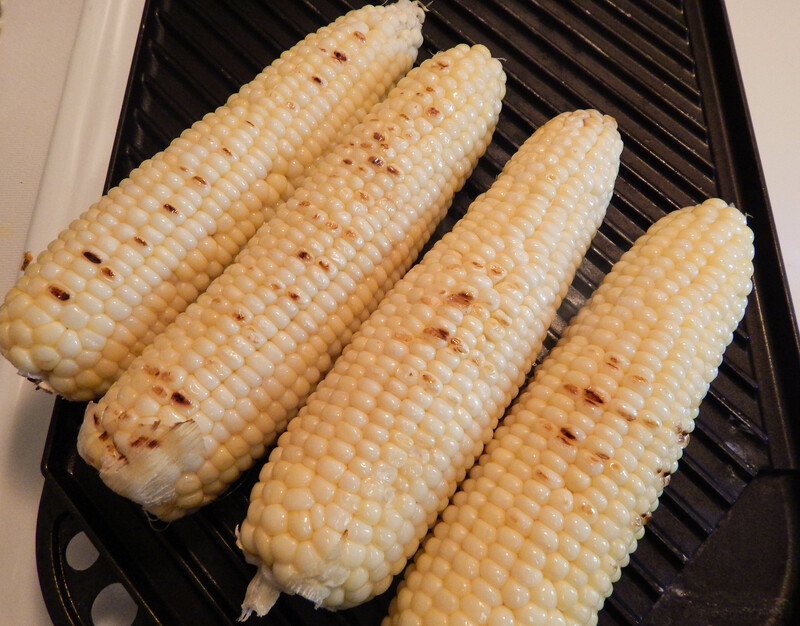 8.Remove Corn from grill and allow to cool for 1-2 minutes. 9. 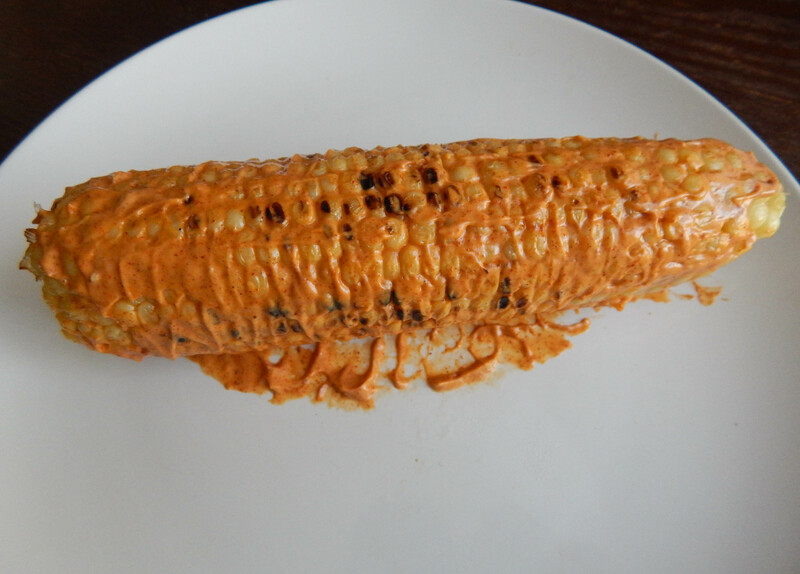 Spread the chili lime mayonnaise on the corn to coat completely on all sides. Once coated, sprinkle the cotija cheese on top of the mayonnaise spread. 10. Garnish with sprinkled California chili powder on top if desired. 11. Prepare all of the corn and serve immediately. I’m thinking of trying this recipe with my niece me Goddaughter next Wednesday, I will let you know how it goes! Excellent, I’m sure cause everything on here is making me hungryyyy!!! Lol Beautiful website by the way, love love love! Hi Ayo! Yay, if you make them let me know how you liked them 🙂 Thank you so much for visiting my site and for your positivity!!! You are awesome!! !